Nice Rack Canada has been building pedalboard systems for Dallas Green since 2012, for various City and Colou, Alexisonfir & You+Me tours. 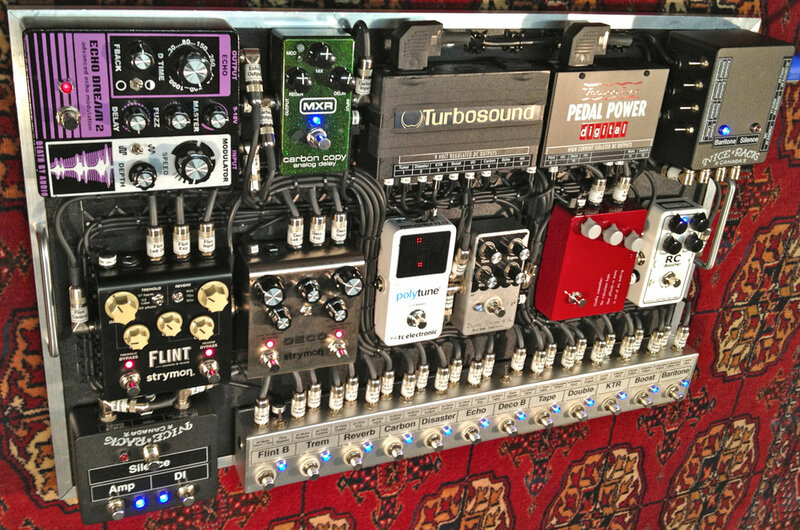 This year it's going to be a new City and Colour album cycle and pedalboard to match. We rebuilt the custom switcher to accommodate some of the updated pedal choices & system functions. New pedal additions to the system this year are the Xoti RC Booster, Klon KTR, Strymo Deco & Flint. We added a new Active Output Splitter & Mute Box. We replaced the old I/O box with a new fabrication featuring 2x remote controlled relays for Muting Functions, a 1mΩ Input Buffer and Switchable Ground Isolation Transformers for each output path. Still powered by Voodoo La, this time it’s a Pedal Power 2+ & Digital.